IMAGE Ramos, Marlene Flores. The Filipina Bordaderas and the Emergence of Fine European-Style Embroidery Tradition in Colonial Philippines, 19th to early 20th centuries. 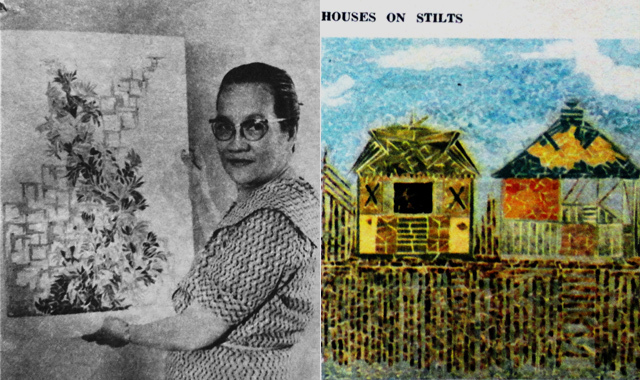 Adelaida â€œAdela" Paterno (October 24, 1881 to January 21, 1962) had an artistic family that included her half-sisters Paz and Trinidad Paterno, painters tutored by maestro Lorenzo Guerrero. Adela, however, made a name for herself by creating intricate â€œhair paintings," using human hair threaded into the weaves of Chinese silk, satin, or jusi. One example of this rigorous embroidered art is a small piece entitled â€œCountry Scene," done in 1897, showing a cluster of nipa huts painstakingly outlined with hair, making the landscape look like a delicate etching. 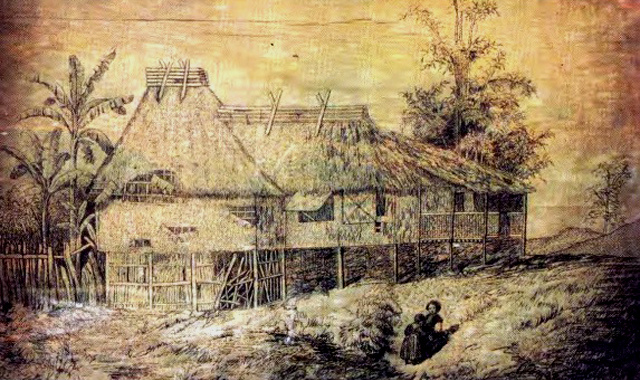 Other extant works include the undated â€œRural Scene with Child," and â€œVista de Mariquina" (1897), all in the Central Bank of the Philippines Collection. Coincidentally, this practice was popular in Victorian England, where locks of hair from the dearly departed were often coiled into flower shapes or other scenes, and then assembled under glass-a kind of mourning art meant to remember the dead. A graduate of the University College of Fine Arts, Prof. Jumalon (1909 to 2000) started his career as a realist painter. When his family moved to Cebu, he became an avid lepidopterist or a collector of butterflies. He eventually headed the Lepidopterist Research Division of the University of San Carlos, becoming the first Filipino scholar to study Philippine butterflies preserved in the Smithsonian Institution, the British Museum of Natural History, and in the Senckenberg Museum in Germany. His fascination with the winged insects inspired him to experiment using the preserved colored wings to make mosaic art. In 1954, he finished his first â€œlepido-mosaic" entitled â€œSabungero," made from frayed butterfly wings. 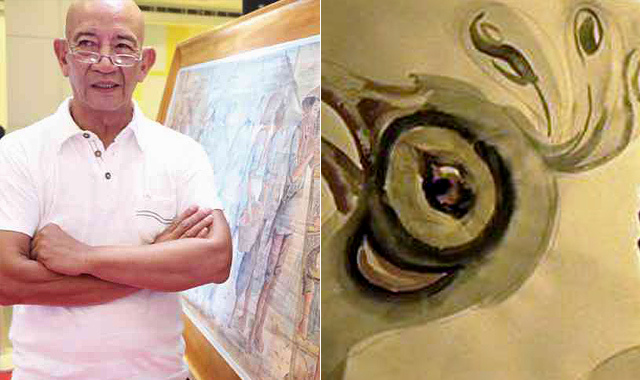 His incredible artworks were soon being exhibited in solo shows mounted in Cebu and in Manila. In 1974, he built a garden-museum to showcase his art and his extensive collection of butterflies that include the prized â€œBirdwing" of Palawan (Trogoneptora Trojana), one of the rarest and largest butterflies in the world. The Julian N. Jumalon Foundation Inc. was put up by his children after his death so that people could continue to see his butterfly paintings in his compound, becoming one of Cebu's foremost tourist attractions. In the early 1960s, Naty Garcia Lozano made news when she launched an exhibit based on her hobby-creating paper mosaic art using colored print ads saved from old magazines. The motherly matron and self-taught artist painstakingly cut and shredded these into strips with a pair of scissors, then glued them piece by piece on a heavy board to form stylized still-lifes, landscapes, and local scenes. This former councilor of Para aque said that she could not bear to see magazines go to waste, so she thought of ways to recycle them. She found out that combining colored strips from different print sources resulted in a pleasing combination of new tones, hues, and textures in her artistic creations. Lozano spends at least five hours a day working on her mosaic art. The celebrated Zorro David (August 30, 1923 to May 24, 2008) is best known for his role as the Filipino houseboy of Elizabeth Taylor in the John Huston-directed movie, Reflections in the Golden Eye (1967). The movie flopped, but David's performance as Taylor's flamboyant companion received glowing reviews from critics. He had actually started a career as a hairdresser in America (he was selected as one of the top 10 hairstylists in the world in 1959). But he also dabbled in art, and among his bizarre creations are his controversial matchsticks paintings-all made from matchsticks of different colors, glued standing up on boards. David claimed that his exhibit marked â€œa first in the history of art, the only time someone worked with matches," while gushing about the â€œbeauty" and â€œflexibility" of a match-adding that â€œYou could play around with it as you would with clay." The New Yorker magazine deemed the artworks â€œinflammable," and therefore, unsafe. David countered by saying that the matchsticks were dipped in plastic polymer, rendering them fire-resistant. Edd Aragon (1949 to 2015), the founding director of the Philippine Society of Cartoonists, moved to Australia in 1979 and began a flourishing career as a newspaper cartoonist. In April 2011, Aragon returned to the Philippines to stage a most unusual exhibit called â€œUnder a Different Light," at the Yuchengco Museum in Makati. Aragon developed a special paint that could only be seen using ultra-violet light. Utilizing this unique, light-reactive paint, he drew portraits of women on white canvas. The lovely images on the seemingly-empty canvases under normal light are revealed only when exposed to the ultraviolet rays of light bulbs installed on the gallery floor. The effect is magical, as the images instantly come alive, with a bluish glow. â€œWe all seek light!" Aragon enthused, when asked about his motivation to experiment with paints and light. Aragon first toyed with painting using this breakthrough technology in 2004, when he was commissioned by a client in Sydney to do the murals of his Sydney restaurant on walls that were installed with black light. The famed "letras y figuras"Â� artist from Bacolor, Alvaro Jimenez (1950) was an industrial graduate of Don Honorio Ventura College of Arts and Trade in Pampanga. Before he made a name practicing and reviving the colonial alphabet art popularized by Jose Honorato Lozano, Jimenez was a teacher-painter who used the large, saucer-sized leaves of the Bauhinia plant for his canvas. Over these leaf arrangements, he painted portraits, landscapes, and pastoral scenes. The novelty leaf paintings caught on with art patrons, which led to other artists to imitate his art. Jimenez then shifted to corn leaves and banana stalks which he favored, as they kept longer when painted with acrylic. Jimenez's extraordinary works have been gifted to President Corazon Aquino, Queen Sofia of Spain, and Pope Francis. 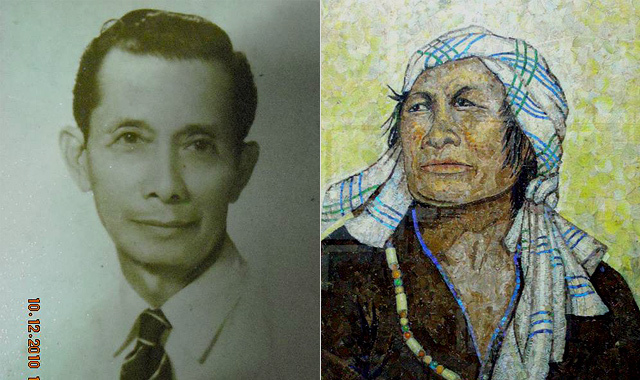 The Nueva Ecijano folk artist known as "Amangpintor" is Elito Villaflor Circa in real life (January 28, 1970). Acknowledged as the â€œFirst Hair and Blood Painter," his interest in painting was kindled by his carpenter-father, who often brought him leftover painting materials and plywood for his use. 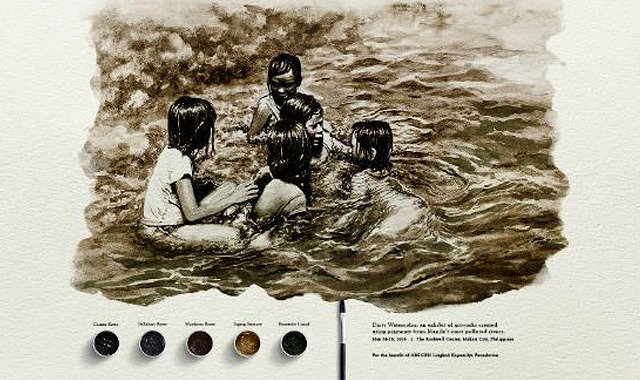 Amangpintor, who favors indigenous art, created his first artwork at age eight, using a mix of soy sauce, water, and tinting color as his medium. He also made paintbrushes using his own hair. It was in 1982 when the artist began authenticating his artworks by signing his name with his own blood. This eventually led to using his own blood as his primary medium in painting such subjects as flowers and related romantic themes. His â€œLukso ng Dugo" paintings from 1992 were also adorned with human hair. In 2015, he paid tribute to Manny Pacquiao by painting the boxer's portrait with his blood. 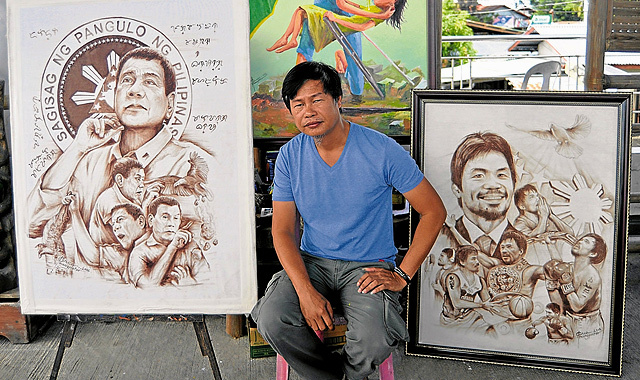 More recently, he used the same medium to create a montage of President Rodrigo Duterte's portraits. Amangpintor believes that painting his blood on canvas creates pieces that symbolize life, love, and sacrifice. 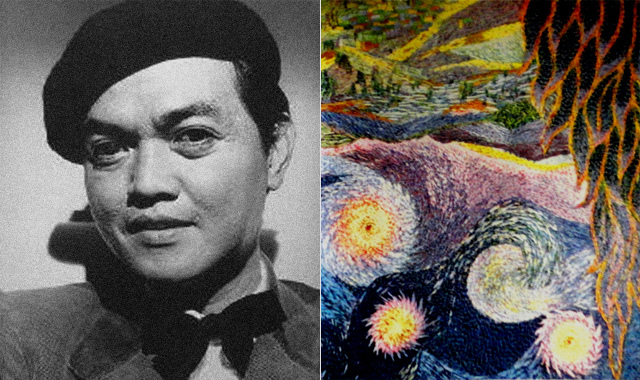 Visual artist, muralist, and educator Jay Dalupang showed his artistic inclinations early; he was often chosen to represent his school in on-the-spot painting contests where he often emerged as a winner. One such achievement was garnering the top award at the Scout Jamboree art contest in 1986 at age 12. In college, he became a cartoonist-illustrator for the school publication, staged his first one-man exhibit of illustrations, and went on to major in Music, Arts, and Physical Education. After becoming a member of the Aklan Visual Artists Association, a second exhibit followed. Known initially for his colorful murals, Dalupang shifted from painting on walls to painting on the human body, using it as his living canvas. Using water-based paints, Dalupang started painting mural patterns on his models, who are then placed before an actual mural wall with the same design-thus cleverly concealing them. His technique and skill drew raves and Dalupang found himself doing commissions to paint models' bodies for fashions shows, cultural events, and physical culture exhibitions. His range of designs include ethnic motifs, monster-horror, graffiti, fantasy, camouflage, airbrush, and urban body art. 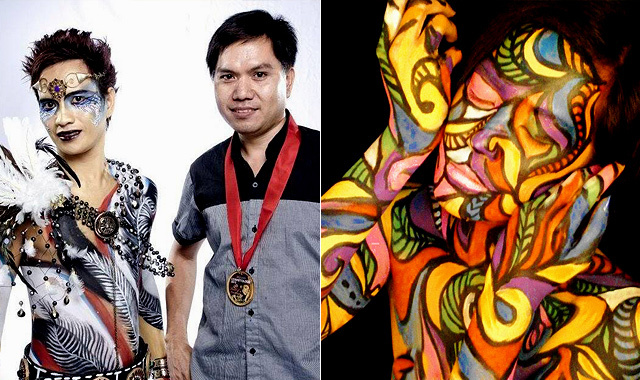 This artist has also dominated many body painting competitions in the Philippines. One Filipino artist who constantly pushes the envelope in the pursuit of his art is Gregory Raymond Halili (1975). Halili spent his early years in New Jersey and graduated with a fine arts degree from Philadelphia's University of the Arts. When he returned to the Philippines after 25 years, he stunned the local art world with his exhibit of exquisitely-detailed miniature watercolor paintings as small as 1"Â�x 1"Â�. This passion for small-scale painting continued in his extraordinary shell paintings. 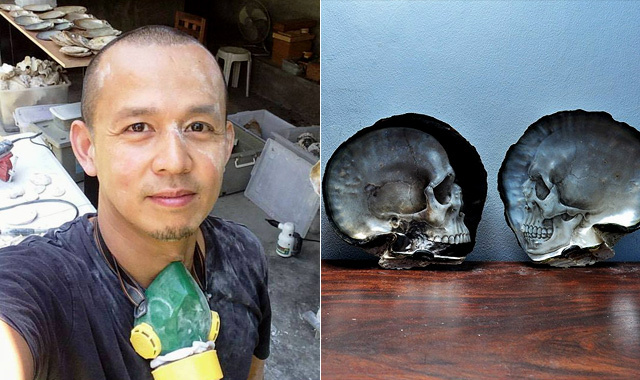 Here, he uses a most unusual medium-mother-of-pearl shells collected from the Philippines-which he carves and paints with images of the human skull. The meticulously-painted skulls are startlingly realistic, anatomically correct right down to the teeth, cranial seams, and bones. A visit to the Ripley's Museum in Shangri-La Mall changed the course of Sunshine Plata's career when she saw a 19th-century signature rendered in coffee. Plata (born January 12, 1980), a Psychology graduate, quit her teaching job in 2007 to become a coffee painter after being inspired by that visit in the now-gone museum. Being a Batangue a, she used kape barako powder dissolved in water, varying the amounts to control the levels of color intensity. Soon, she was becoming proficient in her chosen art, and on January 12, 2008, Plata launched her first solo exhibit of 32 paintings called â€œL.S.D. Trip by Caffeine." To her surprise, she sold 25 of them, thus began an artistic career that flourishes to this day. Plata's artworks are exhibited unframed so that the viewer can take a whiff of the caffeine used in the creation of fanciful winged creatures like fairies and mythical beings, which are her subjects. As fate would have it, two of her coffee paintings ("Reina de la Luna" and â€œFairy of Sorrows"Â�) were purchased by the franchising company of Ripley's Believe it or Not! One painting was even featured in Martha Stewart's show, in a March 2008 segment called â€œArt that Fools the Eye." In the hands of Pampanga artist Ralvin Dizon (born September 5, 1981), an ordinary ballpen can become an instrument in the creation of great art masterpieces. For many years, this homegrown and self-taught artist has been churning out amazingly detailed and realistic works with various subjects-celebrity portraits, still-life, small-town vignettes, and rural scenes-all done with ballpens. 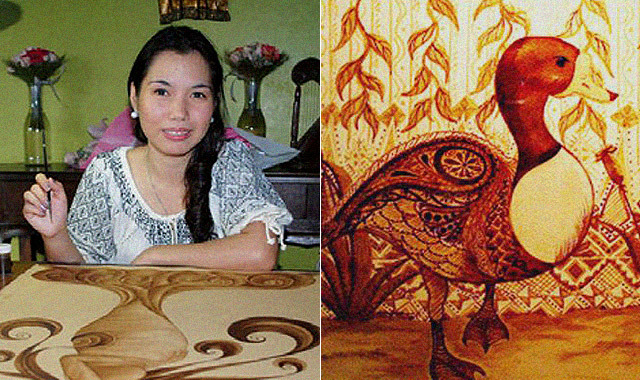 Using laborious pointillism techniques, Dizon laboriously inks each dot and stroke one by one on a board to give form, shape, and life to his subject. It is a painstaking process that takes hours to do, and days, or even weeks to complete, depending on the number of elements, the level of detail, and the size of the piece. But the final results are well worth the wait, as seen from his incredible portraits of Bob Dylan, John Lennon, and his super-realistic street scene paintings populated with rural townsfolk. 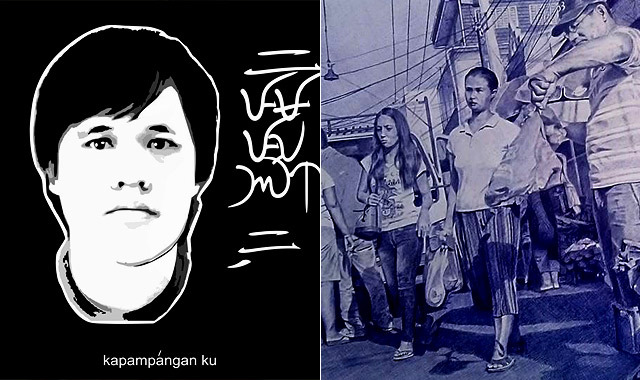 Dizon's ballpen paintings have been exhibited in local galleries; many are also posted online, on Deviant Art and Flickr. From May 24 to 26, 2016, art aficionados were treated to the incredible artworks done by the nation's top watercolorists, led by Toti Cerda, with John Carlo Vargas, Kean Barrameda, Fred Failano, Allan Clerigo, Van Isunza, Luigi Almuena, Renee Ysabelle Jose, and John Ed De Vera. So impressive were the artworks that no one would suspect that they were all painted using dark pigments derived from filthy, polluted water collected from the almost-dead estuaries of Manila. The water was so toxic that before used, it had to be decontaminated and the watercolorists had to protect themselves from the stench by using face masks. The â€œDirty Water" exhibit, which was staged for the benefit of the Kapit Bisig Para Sa Ilog Pasig, certainly drove home the point about keeping our rivers and sources of water clean. The message was clear: That these watercolor paintings would be impossible to create in the future when we succeed in cleaning our rivers-with clear waters that will leave no trace on paper. TBWA/Santiago Mangada Puno, a local advertising agency, conceptualized the exhibit. Eighteen-year-old Andre Manguba (born 1999), taught himself how to draw with the use of colored pencils, and his forte was drawing hyper-realistic portraits of celebrities. During his on-the-job training program with a food company, he was asked to think of innovative ways to promote noodles. This led to his idea of creating food art: He combined his love for celebrity portraiture and food to come up with an incredible series of plated artworks-all made from noodles, pasta, and ketchup. 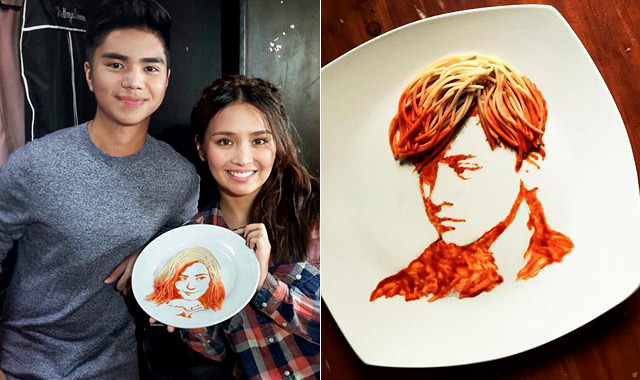 Manguba's pasta portraits of showbiz personalities like Daniel Padilla, Kim Atienza, Pia Wurtzbach, Liza Soberano, Maine Mendoza, and much more were posted on his Instagram account.